As Spring rolls out warmer temperatures and inviting landscapes, Maine motorcyclists can finally enjoy roadways that are free of ice and snow. But as legions of bikers return to the road for the riding season, their safety remains a chief concern. The month of May has been designated Motorcycle Safety Awareness Month across the nation, and Mainers are encouraged to stay alert and watch out for motorcycles, particularly at intersections and during lane changes and turns. In addition, The National Highway Traffic and Safety Administration remind motorcyclists to make themselves more visible to other motorists. In order to prevent injuries and motorcycle fatalities on Maine roads this year, we need responsible drivers who share the road with their two-wheeled counterparts, and motorcyclists who obey traffic laws, speed limits, and never ride while impaired. An estimated 8 million motorcycles traverse the country’s roadways, and thousands can be found right here in Maine. Last year, Maine had a record-breaking 32 motorcycle accident-related deaths, the highest fatality rate for more than 25 years. Though motorcyclists make up a mere 3 percent of all registered vehicles, they account for almost 15 percent of all accident fatalities, according to the NHTSA. 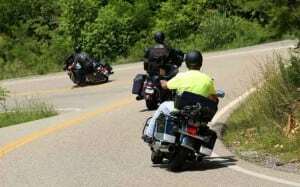 Statistics indicate that helmet use can increase motorcyclists’ chance of survival by 29 percent in the event of an accident, yet Maine is one of 31 states that does not have mandatory helmet laws. Bikers often complain that wearing a helmet interferes with their hearing or views of surrounding traffic. But these claims have been refuted by the NHTSA, which recently sponsored a study to assess the effect of helmet use in both arenas. The study, which included 50 riders of various skill levels and ages, found that “any negative interference of helmets on rider vision appears to be minor, especially in comparison to the protection offered by helmets should a crash occur.” Similarly, the NHTSA found that helmets did not diminish hearing ability at normal travel speeds. In Maine, all new riders who are applying for a license are required to take a 15-hour motorcycle safety course. The course may prove invaluable to novice motorcyclists, as it contains both road experience and classroom instruction. Armed with knowledge and defensive driving tips, riders can more safely share the road with vehicles and hopefully avoid preventable injury. Bikers can also increase their visibility to other motorists by using hand signals when turning and wearing bright clothing that is protective. Motorists are asked to put their cell phones down while driving and check their blind spots twice before moving over. Distracted driving remains a huge concern for many avid bikers, who are more likely to suffer debilitating harm in the event of a crash. Whether caused by driver inattention, improper lane changes or a failure to yield, motorcycle accidents frequently result in catastrophic injuries to the rider. If you’ve been injured by a negligent motorist, it’s important to protect your legal rights and preserve your chances of recouping fair compensation. A successful claim may yield damages for medical bills, lost income, pain, emotional suffering and other losses. To discuss your case with skilled personal injury attorneys in Maine, we invite you to contact Hardy, Wolf & Downing for a free consultation. Our law firm offers steadfast advocacy for residents throughout Lewiston, Portland, Auburn and all of Central and Southern Maine.